Environmental design magma river concept. This digital painting video tutorial shows you how to create environmental design magma river concept art. Learn to paint landscape magma river environmental concept scene digital painting technique. How to draw and paint outdoor environmental scenery visual design for Manga, comics, anime, and video games art. This step by step video show you from start the basic shapes and values, blocking in shape, assign colors for painting to create early conceptual painting and refining detail for the final concept painting. 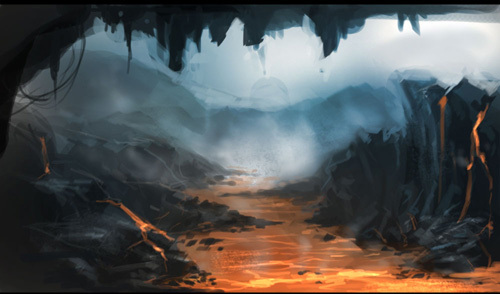 Here is a final color sketch of Magma River Environmental concept. Below are step by step image how to draw and paint landscape magma river. environmental concept art using Photoshop, digital painting tutorial. Step 1, this one I start off with rough random shapes with some blurry visual of valley in my head. Step two, I am blocking in shapes and define the composition. Step three, I added more depth and separate three visual elements. Step four, I begin introducing color scheme into the sketch. Finally, I paint additional texture and refine and finish color sketch. – Dragon Age 2 digital painting video. No, you set the Layer opacity to 50% or how much you need to see through. My bad. I believe you have to set the opacity of your brush to 50%. Did you not the the link say “Brushes Download”, it is right there bro. Hello, thank you very much for this wonderful video but where can you download all magnificents brushes and especially the two brushes used to create the rocks?